Web developers have dozens of tools to make static Hypertext Markup Language pages. But only a handful of tools can create resilient, database-driven enterprise applications. 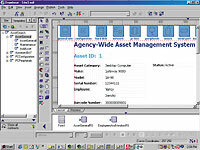 There is a single choice for rapid application development of database content with Microsoft Active Server Pages (ASP): Macromedia Inc.'s Drumbeat 2000, acquired from Elemental Software Inc. of Carlsbad, Calif. Notwithstanding the lack of competition, Drumbeat is one of the most elegant Web development tools in any category. A Drumbeat Starting Point template can easily be transformed into an enterprisewide or e-commerce application, but fine-tuning requires costly tech support. Besides its database capabilities, it has top-notch layout and design features. Pages grow from a template tree. The parent template might have only a header and footer. Child templates can have logos, color schemes and graphics, and the grandchildren can have text. Child pages inherit content from parent and grandparent templates. You add pages by pressing the insert button and dragging pages beneath the template. Move the page to a new parent template, and it takes on the new elements and styles. Unassign a template to format a page independently. It takes longer to describe Drumbeat's storyboard procedure than to execute it. There is no faster tool for Web site structures. Drag-and-drop modification is equally easy. Drumbeat's glaring weakness is tables: Attribute control is limited to rows and columns. Graphic designers feel unhappy with anything less than cell-level control. On the other hand, they get pixel-level control over element placement. That more than makes up for the table deficiencies, considering how long it would take to do the same things with Microsoft Visual InterDev, the most common ASP tool. Drumbeat eCommerce has the standard edition's tools plus site-creation wizards and a sample electronic commerce site that can be modified to support online transactions. Most organizations have legacy documents and Web pages they want to integrate for e-commerce. Many Web authoring tools cannot do this, but Drumbeat developers can import existing Web sites and tack on the e-commerce features. Novices can make basic apps with the wizards. E-commerce and enterprise applications, however, require a good background in transaction technology and at least basic scripting skill. Previous Drumbeat editions were inadequate for more than departmental intranet apps. Drumbeat 2000 supports stored procedure calls, making it powerful enough to access Structured Query Language logic on a back-end database server. Developers can build queries with the on-board SQL wizard or use the Query Manager to import existing SQL queries and views. You can also write queries by hand or paste them from the Query View in Microsoft Access. Drumbeat 2000 supports dynamic queries for putting run-time variables into an application. The SmartElement Toolbar drops design elements onto the page. It automatically codes for the browser type specified. Besides basic layout elements such as text boxes and images, SmartElements supports cookies, Dynamic HTML, ActiveX controls, Microsoft Component Object Model, ASP objects and Java applets. Instead of writing event-handling scripts, Drumbeat uses point-and-click interactions. Out-of-the-box interactions handle forms validation, transitional effects, media controllers, players and cascading style sheets. The SmartElements already know their permitted interactions. Select two or more objects, then right-click to display a list of possible interactions in a separate pane. This is much cleaner than using multinested drop-down menus. A new DataForm Wizard kick-starts even complex ASP applications. The wizard can make drop-down lists, check boxes and radio buttons. A Data Loop component can display multiple records on a single page. I built an employee directory for an intranet using one of Drumbeat's customizable Starting Points applications. Afterward, I rebuilt it from scratch with a redesigned database. The result, a standard drill-down app with a password-protected log-in page, controls access privileges by group membership. Users can view a list of employees grouped alphabetically by last names or can enter the first few letters of a first name, last name or department. The search results automatically generate a table. Each record is hot-linked to a detail page with all the employee information. I added an Image SmartElement and a text box with a path to an image directory that displays each employee's picture on the detail page. Next I added a contract that automatically time-stamps an employee record whenever it is modified. Then I inserted a text field in the detail page and labeled it 'last modified' to display the date without manual intervention. Employees themselves can update everything except for path and security information. I enabled this by simply copying most of the fields from the administrator's update page to the user update pages and adjusting the object interactions. The only code I had to write was a bit of ASP script to make the returned e-mail addresses hot. I found a Drumnote on Macromedia's site, but the code didn't work. Eventually I got help from Macromedia support staff and plugged in a new line that worked flawlessly. Before you run out to buy Drumbeat for e-commerce projects, however, qualify your needs. There are easier products for limited commerce needs. And you should have a programmer or a skilled scriptwriter available. If you have no transaction design experience, read the manuals, go through all the tutorials and play around for a while with the Quick Store starting point. I found a couple of potential problem areas in real-time credit card authorization and capture processing. Voids and returns aren't supported in Drumbeat contracts. If you want to use a vendor to process payments, be prepared to write the code yourself. Most enterprise applications are a team effort, but Drumbeat offers few workgroup features. It needs a starting-point application where visitors can add and update content. Free support is limited to e-mail and then only for installation, configuration and general use issues. Telephone support costs $65 per issue and is similarly limited. Developer support costs a whopping $125 per hour per issue and is limited to four hours. Worse, no one answers the phone on weekends, holidays or after 4 p.m. Pacific time. Drumbeat 2000 eCommerce alone would deserve an A grade, but the limited support drops it to a B.
Steve Graves, a former GCN product reviewer, is publisher of Technical News Service Inc. of Cheverly, Md.